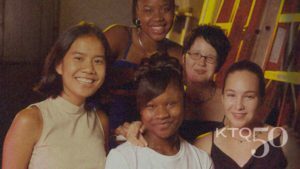 Described by The New York Times as “a remarkable testament to the resilience of youth,” this feature length documentary delves into the hearts and minds of five remarkable young women. Three years in the making, 5 GIRLS is a coming of age drama shot in the style of cinema verite. A special presentation of the PBS nonfiction series P.O.V this film premiered on national public television in the fall of 2001. 5 GIRLS was awarded the Henry Hampton Award for Excellence from The Council on Foundations, The Silver Award: The Chicago Film & Television Competition for Outstanding Achievement from the Parent’s Guide to Children’s Media. 5 GIRLS enjoyed a two-week theatrical run at The Gene Siskel Film Center.